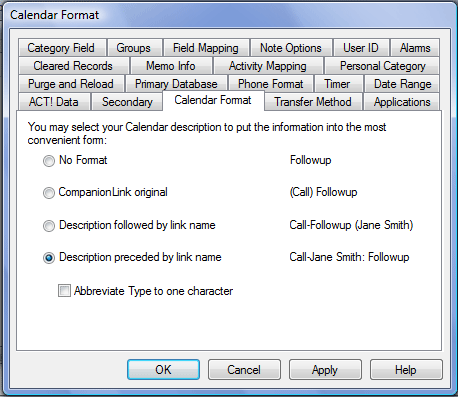 CompanionLink can link contacts to calendar activities. CompanionLink also has a Calendar Format tab that allows you to define where the contact will show up on your phone. If you select the “Description preceded by link name” option, this will put the name of the contact just in front of the subject of the Calendar Activity. This way, when you look on your phone’s calendar, you’ll see the name in your daily schedule. This entry was posted in CompanionLink Products and tagged calendar tab, contacts link to calendar, linked contacts by Rushang. Bookmark the permalink.